(Nanowerk News) Graphane is the material of choice for physicists on the cutting edge of materials science, and Rice University researchers are right there with the pack – and perhaps a little ahead. Researchers mentored by Boris Yakobson, a Rice professor of mechanical engineering and materials science and of chemistry, have discovered the strategic extraction of hydrogen atoms from a two-dimensional sheet of graphane naturally opens up spaces of pure graphene that look – and act – like quantum dots. That opens up a new world of possibilities for an ever-shrinking class of nanoelectronics that depend on the highly controllable semiconducting properties of quantum dots, particularly in the realm of advanced optics. Rice researchers created these fanciful images of electron densities from their graphane-embedded quantum dot calculations. The isosurfaces depict electrons in the valance band that, in reality, would be confined within the quantum dot, and demonstrate that very little charge would leak from the hydrogen-defined boundaries of such a dot. The theoretical work by Abhishek Singh and Evgeni Penev, both postdoctoral researchers in co-author Yakobson's group, was published online last week in the journal ACS Nano and will be on the cover of the print version in June. Rice was recently named the world's No. 1 institution for materials science research by a United Kingdom publication. Graphene has become the Flat Stanley of materials. The one-atom-thick, honeycomb-like form of carbon may be two-dimensional, but it seems to be everywhere, touted as a solution to stepping beyond the limits of Moore's Law. 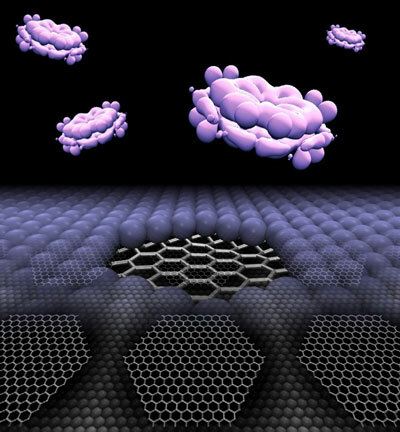 Graphane is simply graphene modified by hydrogen atoms added to both sides of the matrix, which makes it an insulator. While it's still technically only a single atom thick, graphane offers great possibilities for the manipulation of the material's semiconducting properties. Quantum dots are crystalline molecules from a few to many atoms in size that interact with light and magnetic fields in unique ways. The size of a dot determines its band gap – the amount of energy needed to close the circuit – and makes it tunable to a precise degree. The frequencies of light and energy released by activated dots make them particularly useful for chemical sensors, solar cells, medical imaging and nanoscale circuitry. Singh and Penev calculated that removing islands of hydrogen from both sides of a graphane matrix leaves a well with all the properties of quantum dots, which may also be useful in creating arrays of dots for many applications. “We arrived at these ideas from an entirely different study of energy storage in a form of hydrogen adsorption on graphene,” Yakobson said. "Abhishek and Evgeni realized that this phase transformation (from graphene to graphane), accompanied by the change from metal to insulator, offers a novel palette for nanoengineering." "You have an atom-like spectra embedded within a media, and then you can play with the band gap by changing the size of the dot," Singh said. "You can essentially tune the optical properties." Along with optical applications, the dots may be useful in single-molecule sensing and could lead to very tiny transistors or semiconductor lasers, he said. Challenges remain in figuring out how to make arrays of quantum dots in a sheet of graphane, but neither Singh nor Penev sees the obstacles as insurmountable. "We think the major conclusions in the paper are enough to excite experimentalists," said Singh, who will soon leave Rice to become an assistant professor at the Indian Institute of Science in Bangalore. "Some are already working in the directions we explored." "Their work is actually supporting what we're suggesting, that you can do this patterning in a controlled way," Penev said. When might their calculations bear commercial fruit? "That's a tough question," Singh said. "It won't be that far, probably -- but there are challenges. I don't know that we can give it a time frame, but it could happen soon."